Ahead of my appearance at Stirling Libraries’ Off the Page Book Festival (this Monday 10th, at Doune Library, at 7pm), here’s an interview I gave to the Stirling Observer, which talks about what drove me on to write. An unexpected discovery led Edinburgh’s Marianne Wheelaghan to write the one book she could never have imagined producing. JUST a few years ago if you’d asked novelist Marianne Wheelaghan whether she’d ever write a book about her mum she’d have laughed at the idea. She’s not laughing now though, with debut novel The Blue Suitcase – based on her mother’s and aunt’s real life experiences growing up in Germany around the time of the Second World War – going down a storm worldwide. One of nine children, Edinburgh-based Marianne says: “We knew four things about mum when we were wee – she was German; she left Germany after the end of the Second World War and came to Scotland; she trained to be a nurse in Leith Hospital, Edinburgh; where she met my dad. “there was no time for ‘chat’”. What finally changed all that was the suitcase full of letters and diary entries found by Marianne’s father Jack following Gertrude’s death in 2003. They were written by Gertrude’s sister who had moved to Argentina after the war and Marianne, who had studied German at university, set about translating them at her father’s request. They provided a fascinating insight into the experiences of ordinary Germans living under the Third Reich that started to provoke Marianne’s writing itch. The decision to fictionalise events was based on several factors including time and information gaps in her mother’s archive, that still prevailing sense of privacy, and a desire to place this very personal story in a proper historical context. The main reason though, she says, was because: “I was determined to tell as many people as possible about as much as possible. 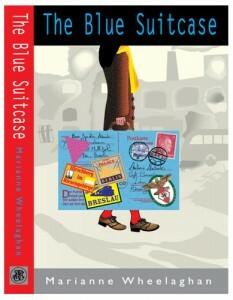 The popularity of The Blue Suitcase has really surprised her Marianne says, especially given its “ordinary German” viewpoint. However she adds: “Such a long time has passed now since the end of the Second World War it seems as if people can read about the events without feeling the need to apportion blame, and are able to empathise with what happened to mum and her family. 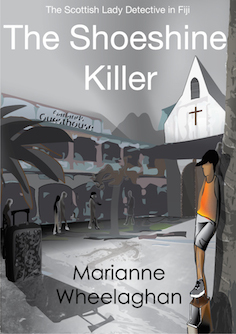 Perhaps having exorcised this particular ghost Marianne’s literary follow up is something entirely different, a series of five thrillers set on different Pacific Islands – an area of the world she knows well after working there for 10 years. 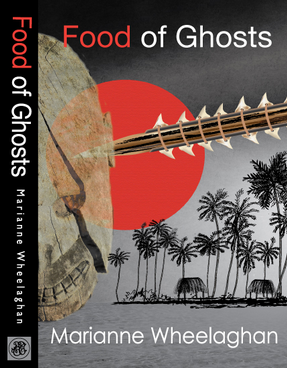 The first novel, Food of Ghosts, is set on the tiny Tarawa and based around “feisty loner” DS Louisa Townsend who travels to the area in search of her roots, but soon finds herself leading investigations into a “particularly bizarre killing”. “Louisa believes, incorrectly, that finding a killer on a coral atoll with a population of less than 35,000 shouldn’t be too difficult, but she quickly realises nothing is what it seems on Tarawa. “When the bodies start mounting up, she worries she may be out of her depth! Marianne Wheelaghan is at Doune Library on Monday, September 10 at 7pm. Tickets £5/ £4. For more information on all Off the Page events see www.stirling.gov.uyk/offthepage, call 01786 432383 or pick up a brochure in local libraries.